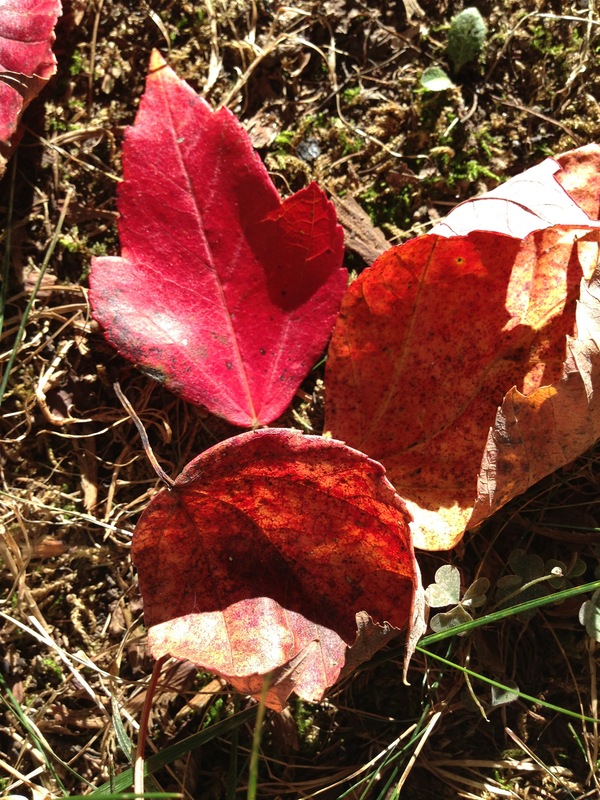 What is it about the change of seasons that makes us pause? Is it the awareness of the passage of time? August in Maryland can often be a hot, sticky, dry time where the grass looks and feels like quills. It is just mid-September and we have been blessed with a string of cool nights and warm, pleasant days. Humidity is low and, without the stickiness, the sky is crystal clear blue. Is it the beauty that makes me pause, the welcome coolness? I’m not sure, but it brings me to a new awareness of being. I see the first leaves turning yellow and as I sit on the porch and write a breeze sweeps through the woods and I am shocked by the amount of leaves that release their grip. Ahh…letting go. A perennial lesson. Release, let go of the things and ways of being that I no longer need, that no longer serves me. I realize it is not necessarily something I can think my way through. I can’t think my way to letting go, pausing at every action, “Does this serve me?” “Can I release this?” Release is a place of not needing to collect. It is a place of dayenu: even this is enough. A place of realizing the bounty in the moment. How little energy it takes when we remember we have all we need and we can just be. Isn’t it truly awesome that the Holy One lays all these reminder lessons all around us for us to access at any time? Ever present, ever supportive. What makes you pause? What is your experience? Categories: Contemplative Living, Contemplative Spirituality, Continuous Prayer, Personal Spiritual Deepening, Prayer, Spiritual Deepening, and spiritual growth. Tags: contemplation, grounding, prayer, religion, spiritual growth, spiritual practice, and spirituality. “Release is not needing to collect.” I like that. Such a wonderful expression for this time. How interesting that when we no longer need to collect, we recollect. Very nice, Steph. Am facilitating a labyrinth walk on Sunday at 8:44 pm to honor the balance of light and dark and to help release, receive, and reflect. This is a great preparation piece for that experience. How lovely that you and Jay are doing labyrinth walks! Blessings! What a good reminder to read today. We have what we need. I was just about to load up…. The approach to ‘release’ resonates with me as well. My thoughts though turned to: how do you teach the the materialistically driven, young professionals that they “have all they need and can just be”? Right now, I am experiencing significant back pain. It is certainly causing me to pause — pain and suffering can do that on occasion. The Fall has always been a time of renewal for me, a new year beginning kind of feeling, but I love your thought of the fall reminding us to let go. To be present to the change of seasons and change in general as a dynamic way of being in the presence of the Holy One. A way of opening to what grows out of letting go. “Release” is better than “letting go,” I think. When I am trying to let go of something i am working hard, peeling back each of my clenched fingers with great effort. Release happens when I relax and let life be what it will. Trees release their leaves. No drama, no clenching, just being a tree in the fall. Nice! I like fine tuning the language. Thank you.